A black and white large format negative of George Dair taken on January 6, 1947. In this view he is sitting on a white sheet with his hands on his legs and smiling at the photographer. George Dair is the son of Douglas (1922-1997) and Jean (1923-2002) Dair. Mr. and Mrs. Dair had four children: Donald, George, Dorothy and Karen. 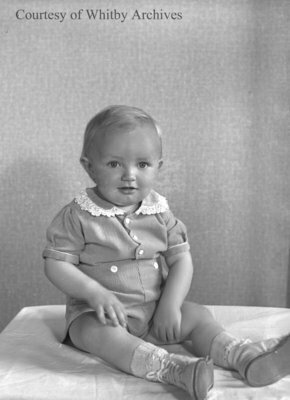 George Dair, January 6, 1947, Marjorie Ruddy. Whitby Archives A2013_040_556.